Christopher Columbus reached the New World in 1492, but some experts say Polynesian explorers beat him to it. There’s little evidence to support this fringe theory, but scientists have pointed to the presence of sweet potatoes, a plant thought to be native to the Americas, in the South Pacific as potential proof. A genetic analysis of the popular tuberous root and its relatives has now effectively quashed this hypothesis. North America’s first human settlers likely arrived from Siberia via Beringia some 15,000 to 20,000 years ago, but that doesn’t mean these venturous humans were the only migrants to the continent. Take the Solutrean hypothesis for example, which suggests some early European Stone Age hunter-gatherers made the trek along a North Atlantic ice bridge to the North American east coast between 18,000 and 25,000 years ago, possibly a few thousand years before the first Eurasians began to trickle in on the opposite side of the continent. More controversially—not that the Solutrean hypothesis isn’t controversial enough—it has also been suggested that South Pacific Islanders made the treacherous trek from Polynesia to America by boat, and that they arrived several hundred years before Columbus. As evidence, scientists have pointed to the presence of non-native chickens in South America, traces of apparent Polynesian DNA among members of the Brazilian Botocudos tribe, and the unexpected presence of sweet potatoes in Polynesia well before the arrival of Captain Cook in the 18th Century. Different varieties of sweet potato on display at the International Potato Center in Lima, Peru. Taken together, these three clues could mean that Polynesians sailed back and forth between the South Pacific and the Americas, which explains why chickens and sweet potatoes exist in the South Pacific, and why Polynesian DNA (apparently) exists among a South American indigenous population. But this theory is on some seriously shaky ground; the first clue, chickens, was discredited back in 2014, and the second, Polynesian DNA, is based on very flimsy evidence. Now, thanks to a new study published today in Current Biology, the sweet potato hypothesis is also in serious doubt. Sweet potato specimen collected in 1769 from Society Islands. “The sweet potato’s early presence in Polynesia has been widely interpreted as strong evidence for human contact between Polynesia and America in the Pre-Columbian era,” said Pablo Muñoz-Rodríguez, a co-author of the new study, in a statement. The presence of the sweet potato in Polynesia was documented as early as the time of Captain Cook’s voyages on the Endeavor, a weird finding considering the sweet potato, a root vegetable that belongs to the morning glory family of plants, originated in the Americas. “However, our finding is that the plant probably reached the Pacific Islands through natural dispersal by birds, wind, or sea currents in pre-human times,” he said. To reach this conclusion, Muñoz-Rodríguez’s team, which included researchers from Oxford University, Peru’s International Potato Centre (field trip?! 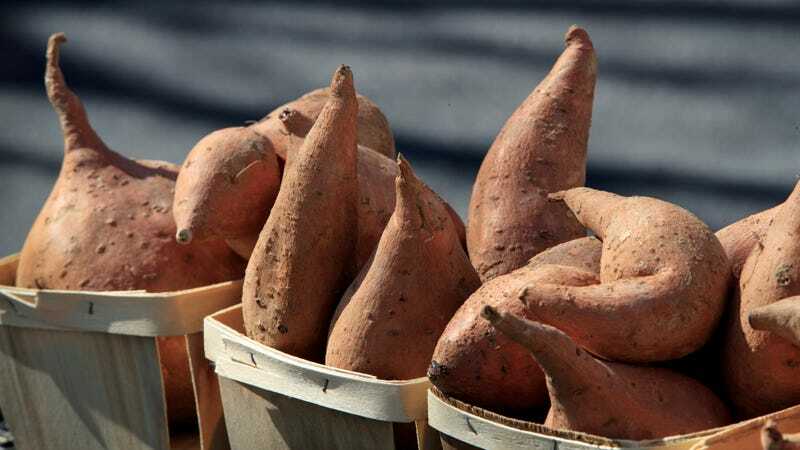 ), Oregon State University, and Duke University, analyzed nearly 200 specimens representing all known varieties of the sweet potato. This included its wild relatives, and samples taken from both living plants and those extracted from museum specimens. Results of the DNA sequencing showed that the sweet potato originated from a progenitor species that existed around 800,000 years ago, and that the sweet potatoes found in the South Pacific that date back to the time of Captain Cook diverged from their American-based ancestors some 100,000 years ago—long before humans were anywhere near the South Pacific, or the Americas for that matter (our species emerged some 300,000 years ago). After the time of Cook’s voyages, however, Europeans spread other varieties of sweet potatoes around the Western Pacific, including the Philippines. This finding damages the notion that early humans were traveling back-and-forth from Polynesia to the Americas prior to the arrival of European colonists—but it doesn’t kill the theory outright. There’s that DNA issue to contend with, and a rather strange co-incidence that’s worth noting: The word for sweet potato in the Polynesian language is “kuumala,” which is suspiciously close to the word “kumara,” which is how the Quechua people of northwestern South America refer to it.